Princess Casino formally knows as Princess Star launched in 2014 and is part of the Princess International Group that are one of the largest casino networks and operates an owns almost 40 casinos scattered across South and Central America, Africa, Eastern Europe, and the Caribbean. Princess Casino is powered by leading brand software providers such as NetEnt, Ezugi, SoftSwiss and Amatic Industries, which enables the online casino to feature a great selection of highly popular titles. In providing international entertainment, its broad variety of banking options includes Bitcoin in particular for players who prefer anonymity as well as Zimpler perfect for mobile users. The wide range of casino games is also accessible on the go, and mobile players can enjoy games on all Android devices as well as iPhone and iPad. All data transformation to and from Princess Casino is protected via 128-bit SSL encryption technology and software are regularly subject to rigorous testing and certified as fair and random number generated by iTech Labs. All payment processing is handled by authorized personnel and handled according to the high industry standards. Registering a new account at Princess Casino enable players to take advantage of an attractive welcome package containing three bonuses. The initial deposit is awarded a 100% bonus worth up to £100 plus 25 free spins is added on Lucky Lady's Clover video slot. The new member's second deposit enjoy a 70% bonus worth up to £100 plus another 30 free spins on Lady Clover video slot. The third deposit is welcomed by a 60% bonus worth up to a maximum of £100 and 35 free spins. Players who prefer to deposit in Bitcoin will receive an initial deposit bonus of 100% worth up to 0.5 BTC. The minimum deposit to qualify for the bonus is £20 or 0.5 BTC, and the bonus is subject to wagering of 50 times before winnings can be withdrawn. Several monthly bonuses offer available to members and could include up to 50% reload bonuses, and currently, there is no voucher, no deposit or free spins bonus offers available at Princess Casino. Members also receive promo details via email as well as new release notifications and other casino news. A broad range of banking methods are available to Princess Casino members and include Visa, Maestro, Neteller, Skrill, MasterCard, Bitcoin, and Bank Transfers. Currencies accepted include $ and €, as well as BTC and what most certainly impress, is the withdrawal periods. The processing time for credit cards are one up to 3 days depending on the card players selects and e-wallet withdrawals are processed within one day while Bitcoin withdrawals are processed instantly. Exact country popularity information for this casino is unavailable. As it is an international casino, the demographics of its popularity is broad, and it does appear to have a larger level of popularity in Europe. Powered by some of the most reliable and talented software developers in the industry including NetEnt, Ezugi, SoftSwiss, BetSoft Gaming, Belatra, Pragmatic Play, Endorphina, EGT and Amatic Industries a wide variety of options is available to all online casino players. Gaming categories include slots, craps, poker games, jackpot games, roulette, video poker, fruit slots, casual games, and live casino games. Some of the most popular video titles are available at Princess Casino and include An Escape From Alcatraz created by Belatra, Eye Of Ra by Amatic, Crazy Starter video slot powered by SoftSwiss and Romeo and Juliet designed by Pragmatic Play. A large selection of NetEnt games is part of the most preferred slots and includes Scruffy Duck, Copy Cats, and Big Bang. Most of the progressive jackpot collection is titles created by IGT. Several poker variations are available in the poker games section and include 5 Live Poker games powered by Evolution while SoftSwiss created all other poker games. Live roulette options are powered by NetEnt or Evolution Gaming while Ezugi creates Live Roulette, and SoftSwiss offers several traditional roulette games. 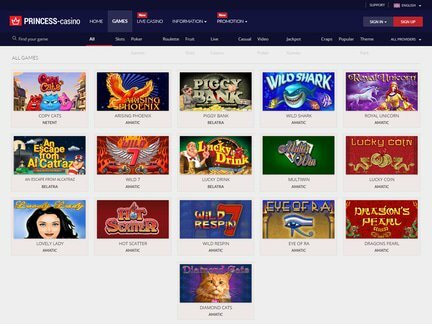 While it is unknown if players at the casino have won any large progressive jackpots, there is a constant flow of winners that are displayed on the casino homepage. This is a nice addition as it helps to identify hot games and the amounts recently won. There have been a limited number of complaints posted online relating to winnings not being paid, or having been confiscated. However, it is important to recognize few casinos go complaint-free, especially when it relates to non-paid winnings when playing under a bonus. This is the case with complaints found relating to Princess Casino, with many of those being justified by the casino due to failure to comply with the terms and conditions of the bonuses received. Princess Casino is operated by Direx DV and is licensed and regulated by the laws of Antillephone. Support is offered via an online email form, and live chat is available 24 hours a day all seven days of the week. Princess Casino features several Amatic games that are familiar to players who enjoyed the games at land-based casinos and the good qualify Evolution and Ezugi table, and live games offer players of skill several variations of traditional favorites.